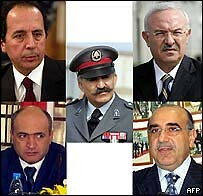 Police have arrested 3 former Security Chiefs (below) in Beirut in connection with the murder of Rafiq Al-Hariri. Mustafa Hamdan, the current head of the guards of President Emile Lahoud has also turned himself in to the police. Hamdan was implicated by the UN investigator for his role in the murder. All three resigned after the 'unity marches' of February and arch this year - many of the demonstrators blamed these people personally. Although the officials were connected with Syrian hegemony in Lebanon, the news will be a relief to Syria, which has come under fire by the UN investigator for being slow to co-operate. Former MP Nassir Qandil is also being sought by Lebanese police for his role in the murder. Layalina magazine has cut and pasted an entire blog post - its words and photograph - without giving credit to its author, one of Syria's most important bloggers, Ayman. Ayman's Damascene Blog is one of the most widely read and oldest blogs written in Syria. He posts a daily photo from his city, and the story behind it. In January he posted a photo from a wedding he attended, along with a traditional Syrian wedding chant. And this month, Layalina has shamelessly stole the entire post - even the photograph. Layalina is a pseudo-celebrity gossip photo rag published in Lebanon. It started out on the Beiruti nightlife scene and then spread to Damascus a few years ago. It's light on words, and filled cover-to-cover with photographs. Each month Layalina's photographers go to every party, concert, event, meeting, any place in fact, where Damascenes might have dressed up and put a bit of make up on. They then take photos of every crowd, and get their names. Those photos go into the magazine, much to the delight of some Damascenes who seem to rate their popularity on how often they get into Layalina. I take pride in how rarely I make it into Layalina. The interesting thing is the price. Layalina sells for about $15. That's an incredible price in a country who's average magazine costs less than half a dollar. What price fame? A Syrian representative will meet the UN investigator in charge of the Rafiq Al-Hariri probe in Geneva within 24 hours, according to the UN. It comes just one day after the investigator, Detlev Mehlis, criticised Syria's failure to co-operate fully. The US quickly accused Damascus of hindering the investigation. And Lebanon's Prime Minister sent a veiled plea to Damascus, saying that 'all sides' must help the UN determine what happened to Hariri. The announcement of the meeting comes from Al-Mustaqbal Television in Beirut, which was owned by Rafiq Al-Hariri (and has now passed to his son Sa'ad). Sa'ad himself said: "countries that are brothers and friends of Lebanon are required to cooperate." At the same time, the Syrian Foreign Ministry has back-peddled and says that: "Syria is ready to cooperate with the international enquiry commission to arrive at the truth in the crime of Rafiq al-Hariri's assassination." The UN noted that Syria offered 'talks' with the UN investigator, but the UN says that is not enough - they want interviews and official documents. Embarrasingly for Syria, Israel and Jordan were praised for their help in the investigation. Syria is hindering the UN investigation into the death of Rafiq Al-Hariri, according to the UN investigator Detlev Mehlis. The UN says it still hasn't even received replies to its requests for interviews or documents issued four weeks ago. Syria says it is ready to discuss the issues and its not trying to hinder the investigation, but it does seem to be burying its head in the sand. The BBC moved the story up from a minor side story in the region, to one of the Middle East's top stories. The US is already making political capital from it: "Let there be no ambiguity about the American view that Syria's lack of co-operation is not acceptable." said the controversial beliggerent American ambassador to the UN John Bolton. It reminds me of the story of one person present at Syria's negotiations with the EU to sign a trade agreement. Syria was arguing over a point, and the EU representatives didn't understand what they were talking about. Only then did it become clear that Syria had brought with it a copy of the EU-Syria deal which was years out of date. is it possible that someone in Damascus has filed the UN's interview request in the wrong building. The wrong country? Damascus is set to have its largest development for decades. A 50-storey hotel - by far Syria's largest - and shopping centre complex is set to be built in Damascus. The 'Damascus World Commercial Centre' will house two forty storey aparetment blocks, two forty storey office blocks, a cinema (Damascus's current western cinema is attached to the Sham Palace hotel) and a theatre. 3600 jobs will be created by the development - to build it and to staff the centre when it's open. The project is being carried out by Syrian expatriates living in the United Arab Emirates - a company called the Tiger Group. It's one of the first projects to be allowed under a recent law to promote foreign investment. Before that law was passed foreign investors struggled to gain access to Syria's closed economy. The Four Seasons Hotel on the Mezzeh Autostrade became Syria's most prestigious hotel when it opened recently - a project pushed through by Saudi money. It's not clear where the new development will be located or when building will start. Syris is not supporting, funding, helping or even turning a blind eye to the violence in Iraq. Syria's not involved. That's according to the Iraqi Transport Minister Awdeh Al-Maliki, who left Damascus today after a three day visit. "I can assure you that the Syrian government has nothing to do with what is happening in Iraq,” he said. Also today the Iraqi government switched its anger from Syria to Jordan. Government spokesman Laith Kubba said that the insurgency is being supported from inside Jordan, and that support is "unacceptable". He said that former Ba'athists are beign harboured in Jordan and are supporting the rebels in Iraq. Syrian police officers have been killed in a raid on a terror group which planned to attack Damascus. In recent months Syria has been the victim of militant attacks, in Damascus, Homs and near the border by Islamic extremists. The exiled Muslim Brotherhood - which fought with the government in 1982 in Hama, costing 20,000 lives - has called for regime change, ending its policy of dialogue. Police say the officers were killed by a group called Tanzeem Jund Ash-Sham - they carried out a suicide bombing in Qatar which killed a number of foreigners. They've also claimed responsibility for other attacks around the Arab world, and were planning more attacks in Syria. Their stated goal is war on 'un-Islamic' elements - the Gulf states, oil fields, western military bases, and Syria's secular government. The attack happened in Madaya, 40km north of the capital. A bomb has exploded on the Beirut coast, in Zalka. No-one is thought to have died in the blast this evening, the first such explosion for months. But two people have been injured. Daily flights are set to start soon from Syria to Iraq. It's not clear where they'll be flying to - Royal Air Jordanian is one of the few airlines to fly into Iraq, it goes to Baghdad, possibly because it is safer than travelling by road! Even so, pilots must do a 'corkscrew landing', coming down from crusing height to the runway in an incredibly short distance. It is extremely dangerous, but less risky than being caught by rebels. Syria's decision underlines a warming of relations between the two countries. Syria recently agreed to open an embassy and post an Ambassador to Baghdad for the first time since the war. But that was before the spate of diplomatic kidnappings, which saw a clutch of Arab diplomats murdered in Iraq's capital. It also shows that Syria has recognised the Iraqi government's legitimacy, and wants to boost its neighbour's economy. The move comes after Iraq's transport minister visited Damascus. The two countries have agreed a raft of air, sea and road ties. "We are linked with Syria by many ties, in addition to neighborhood and pan-Arabism... we have common history and we seek that Syria has a distinguished role in backing Iraq," said Iraq's transport minister Awdeh al-Malki after meeting Syrian President Bashar Al-Assad. Syria has one of the world's highest population of Iraqi refugees - mainly in the Southern Damascene suburb of Sayida Zainab. Ghraoui, one of the city's most exclusive sweet shops is the feature of a New York Times article. Perhaps because of the power of New York's Syrian community, or just the increasing world focus on Iraq's neighbour. Ghraoui has been around for 200 years. It is located on Sharia Abu Roumaneh, the embassy district, and the city's most affluent road. The owner says his speciality of dried fruits was copied by the French during their time ruling Syria. Those fruit confits are now to be found in exclusive roadside Parisien cafes. Their tiny dried fruits are picked when they are still small. Baby apples grow on the hills above Damascus. I remember eating chocolate coated coffee beans from Ghraoui's shop near Saa'hat Yousef Al-Azmeh just two days before the war started in Iraq. I'll always associate the taste of bitter coffee flavoured chocolate with fear and trepidation. We sat in a cafe just round the corner from Azmeh. And if you can't live without Ghraoui's conconctions, I suggest you try Semiramis - equally expensive, and located in Sha'lan, near Pitstop and the Benneton store. Ghraoui's website is here, and the New York Times article is here. It is articles like this that will show the West the real face of life in Syria - no more politics, no more borders, just sweets. Or at least one very upmarket face. "The Americans won't control their side of the border, accept our offers of collaboration, allow us the surveillance equipment we need - then accuse us of aiding a resistance that, they know, is basically Iraqi, even if some foreign fighters do get over our frontiers, which - they also know - cannot be sealed without investing resources way beyond our means." The words of a Syrian commander at Wadi Sawab, guarding the Syrian-Iraqi border. (From David Hirst, The Guardian). Palestinians in Syria suffer. 50 students per classroom. Ghettos of packed temporary housing on the outskirts of Syria's major cities. But they fare better than Palestinians in other Arab countries. The refugee camps in Damascus are the most well funded and largest in the world. Palestinians also have Syrian nationality, and the right to work, unlike in neighbouring Lebanon. But they are still refugee camps. So UNRWA - the UN agency which provides health and education for the refugees - and GAPAR, the Syrian government agency responsible for the refugees want to improve their lives. They want to make the camps self-sufficient within 5 years. The agencies want to allow the communities to support themselves, backed up by the security net of government and UNRWA support. One of the first projects was to move 25,000 people (5000 families) who've been living in military barracks in Aleppo. They've been moved to the Ein Al-Tal camp nearby, into newly built flats. In the barracks, five families lived together, with appaling hygine and no sewage or ventilation systems. They also lacked drinking water. Another 300 families (1500 people) will be transferred next year. Syria is host to 400,000 official Palestinian refugees, and UNRWA provides free education in 115 schools. Most Palestinians in Syria fled from Palestine when they were ethnically cleansed in 1948 from their homes in Haifa and Jaffa on the coast of what is now Israel. The Arab Organisation for Human Rights in Syria - one of the few independent NGOs operating in Syria - says members of the Kurdish terror group the PKK have been involved in clashes with police in Ein Al-Arab. The PKK was legal in Syria until 1998, until Turkey nearly went to war with Syria after accusing it of harbouring PKK members. the PKK has waged a geurilla war in Turkey for years, demanding a separate state for the Kurds. Estimates put the number of deaths at 30,000. Syria was free from PKK violence because it legitimised their activities. But since 1998 things have changed. The US considers the PKK a terrorist group, and blames it for the recent bus bomb in Turkey which killed a group of tourists. The Arab Organisation for Human Rights in Syria condemned the PKK's violence, and the police's reaction, and called for restraint on both sides. The AOHRS says the police did not use violence, but used tear gas and made some arrests. Homs is set to get a new radio ststion, after an international media workshop took place in the city. The workshop was organised by British media organisation, the Press Association. The PA is Britain's official news agency, but organised a conference in the central Syrian city to discuss the rights and responsibilities of media outlets. It's an attempt to develop Syria's state-owned media. Recently, a private investor announced he was to set up Syria's first private TV channel. After the gathering, Homs governor Muhammad Iyad Ghazal said that the new station was part of the government's widely anticipated 'administrative reform', and that the radio station would be run by journalists free of government interference. It'll all take place under the watchful eye of the PA. The UN has made a proposal to solve the 'Hizbollah problem'. They want the group's fighters, and border guards to join the Lebanese Army. It's an interesting compromise. The US wants Hizbollah to simply disarm, and for the Lebanese Army to take up the group's positions in the south and along the unofficial border with Israel. But by changing uniforms, Hizbollah's fighters would gain international legitimacy. And they'd protect Hizbollah, which would finally be able to claim that it is ONLY a political force, and no longer a militia. It's days of kidnapping and hostage taking are consigned to history (Hizbollah has not engaged in terrorism since the war - and even then, the majority of its targets were military). party ... in government might look a bit odd," he said. Lebanese army and thereby into the government apparatus." In June I reported that the demonstrations cost Lebanon $2 billion. But that's risen to a massive $3 billion - making Lebanon's debt $36 billion. Lebanon's debt is already the highest in the world. Why? Because the tourist industry has been destroyed. There's been a 20% drop in people rediscovering the 'Paris of the Orient', 'The Switzerland of the Middle East'. They had been coming back since the end of the Civil War, but with political assasinations, millions of people on the streets and the release of warlords like Jaja and Aoun to fight their battles again, the West is getting scared of George Bush's new playground. Lebanon had 1.5 million visitors last year, a huge amount for a country of just 3 million people. This year the number's expected to just about hit 1 million. Lebanon's tourism minister's targetting Arab visitors, and rich Lebanese expatriates living in France, Britain, the US and South America (Lebanon has one of the Arab world's highest number of expats). Lebanon is almost unique in the Arab world in that it has no oil - it's economy relies almost completely on tourism. It imports electricity from neighbouring Syria. It also relies heavily on banking - Beirut was the banking centre of the Arab World until the war, a reputation the city's struggled to rebuild since 1990, but with the post-Hariri events, investors as well as tourists are getting jittery. No income, and a rapidly growing debt. Money - Lebanon's coming crisis. Syria has requested the extradition of Omar Bakri - the former leader of British-based extremist group Al-Muhajiroon, a group allied with the Muslim Brotherhood. Britain was considering treason charges against him so he fled to Lebanon this week. He was arrested in Beirut but released, and now Syria has formally requested his extradition to face charges in Damascus. Lebanon says that because he holds Lebanese nationality he can not be extradited. He is Syrian born, but lived in Jordan. He fled from Jordan more than 20 years ago and was granted political asylum in Britain. Since then he has been banned from many British mosques. He continued to preach his radical violent agenda outside mosque doors often receiving angry reactions from Muslims. Extremist leader Omar Bakri arrested in Beirut. The radical muslim leader Omar Bakri, who has fled from London, has been arrested. It's not clear why. He is the former leader of Al-Muhajiroon, and has praised the September 11 bombers as the 'magnificent 19'. More recently he said he would not inform police about potential suicide bombers in Britain. He fled to Lebanon when it became clear that he would be arrested in Britain. He is still threatened with detention if he returns. Bakri has joint Lebanese-Syrian nationality, but hails from Jordan. He went to Britain in exile from Jordan, and began preaching hatred. His supporters campaigned outside British mosques, after being barred from many mosques. Ahmedinjad was the best thing to happen to Syria in the last two years. Syria's problems started during the Iraq war when Bashar carelessly wished for the defeat of the invading forces. Since then, Syria has been added to Washington's hit list. Iran was no longer the issue (remember the axis of evil? Iran, Iraq and North Korea). It always struck me as strange that North Korea would threaten to build up its arsenal of nuclear weapons, and even boast about using them. Iran would continue to use nuclear fuel and act in a hostile way towards the West. But Syria - which has shown every possible sign of placating America's wishes (pulling out of Lebanon, recognising the puppet Iraqi regime, and even offering peace talks to Ariel Sharon) was still America's Most Wanted. But now with extremist Ahmedinjad pushing Iran to the brink, Washington's eyes have finally turned away from Syria to the next piece of meat. Donald Rumsfeld accused Iran of smuggling weapons into Iraq, and there is a looming crisis over Iran's use of nuclear fuels. The worst thing Syria could do is associate itself with Iran. But oops, where did Bashar visit yesterday? Tehran. 'Syria is strangling Lebanon's economy' - the words of Condeleeza Rice when she heard about the delays Lebanese truck drivers were facing at the Syrian border. But now America has resorted to the same tactics - and for the same reason (security) - and apparently there's nothing wrong with that. American troops are blocking Syrian trucks from returning home. Hundreds of drivers have been stranded in the desert for three days, far away from their family, and losing money every day. Supplies of water and food are dwindling, and temperatures are said to be unbearable. 700 trucks are currently at a standstill, while Iraqis and Turkish drivers are being allowed to cross the border into Syria freely, according to the Arab Organisation of Human Rights. Some drivers think they are being used by the American forces as a human shield for the American military base which happens to be right next to the border post. Some were allowed through after bribing the Iraqi guards. That's according to former CIA agent turned whistleblower Robert Baer. In a British documentary 'The Cult of the Suicide Bomber', Baer carried out an investigation into the phenomenon of suicide bombings during the 20 year Israeli occupation of Lebanon. 23 October 1983: 241 American Marines are killed in the most powerful non-nuclear explosion since the Second World War. Baer was a CIA agent in the American Embassy in Beirut in the 80s when 2 suicide bombs attacked the embassy. He visited the head of Lebanon's Military Intelligence. Why, Baer asked, did no group claim responsibility for the barracks bombing? Because the country that was responsible doesn't want it to be known, the General replied. So you are blaming a country? I didn't say that, said the General. Can you tell me which country was responsible, Baer asked. I don't have that right, the head of Lebanon's Military Intelligence said. Former inmates at the notorious Khiam prison in the former Israeli-occupied south Lebanon have returned to stage a sit-in. The hilltop prison was the scene of some of the most notorious massacres and torture sessions of the Lebanese Civil War. It was run by members of the Israeli proxy 'South Lebanon Army'. Most SLA members are now living in Israel. But Parliament is now discussing their return. 200 former prisoners, some of whom were presumed dead, returned to the prison carrying photographs of inmates killed by the Israeli occupiers. "Those collaborators ... who chose to flee with the Israeli enemy made the choice with their own will because they were involved in the blood and killings and tortures. They are condemned, internationally and locally," - the words of Atallah Hammoud, the group's spokesman. 7000 SLA members fled to other countries after the collapse of the Israeli occupation in the year 2000. 4000 have since returned, and 3000 have been sentenced to long prison terms by a Beirut Military Court for collaborating with Israel. 80 have been sentenced to death in absentia for murder. "Two of your beautiful daughters are in the hands of foreigners - Jerusalem and Baghdad." "The foreigners are doing to your daughters as they will." The Lebanese Army has run out of ammunition. After years of demanding that Syrian troops leave Lebanon, Beirut's right-wingers may now be wishing they were still there. They protested that Lebanon was capable of protecting itself, and that its army could do the job the Syrians did for 15 years. But they've been criticised by the UN for flawed investigations into the recent political murders. And now they didn't even realise they were running low on ammunition. But that's not the end of the story. The haven't even got enough spare parts for their vehicles and equipment. They're just across the border guys! Some Lebanese MPs have been accused of trying to sabotage Fuad Siniora's recent visit to Damascus. During that trip, he was able to patch up the relationship, and re-open the border after Syria restricted access on the Damascus-Beirut highway - they sited security reasons. But some Lebanese MPs would have profited from continuing tension in the cross-border relationship. But the winner is clearly Siniora, and those calling for good relations with their eastern neighbour. Syria is today celebrating murder. A day which heaps dignity on men who carry arms. The Syrian press is today singing about the Syrian Army's Lebanese peacekeeping mission - its most successful deployment since the war of liberation in the 1940s against the French. The border has re-opened, and hundreds of trucks have finally been allowed through. The sharply timed move will allow Lebanon's new Prime Minister to take the credit: he visited Damascus just one day earlier to deal with - the border issue. They had been stuck for weeks, with Syrian officials citing security concerns: weapons were found in the border region last month; at the same time Syrian forces were battling with Islamist militants across the country. The trucks had been crossing at rate of just a handful each day, but it seems the tension here is over. Galloway's finished ranting at the Al-Assad library in Damascus. He praised Syria's stance against (Western) hegemony in the region. He said it stood for justice and international resolutions. On Lebanon, he said that Syria had ended the Civil War, and when it threatened to leave, even those who used to opposed its presence demanded it stay. He blamed terrorism on the existence of a single superpower, with unrestrained power: the US. "How do we expect that those whose land is occupied and relatives being killed would not resist and fight those who occupy their land and kill their people?" He said. He called for a distiniction between terrorism and resistance to occupation (that's particularly important because Arab League Secretary General Amr Moussa has finally conceeded to Kofi Annan that there is no difference: killing civilians is terrorism EVEN IF it's in the name of freedom fighting). He called on the world to stand by the Palestinian and Iraqi victims of terrorism. He claims that dialogue will ('will', not 'should'!) replace wars, terrorism and occupation. There you go, rant over. The first privately owned TV channel in Syria will start broadcasting on September 1st. It has already started test transmissions from its broadcast centre in Dubai. It is thought to be broadcasting on Arabsat, and is expected to be free-to-air. Since Syria relaxed its media laws during the Baath Conference in June, this is the first broadcaster that has taken advantage of the new rules. During a previous relaxation in 2000, satarical newspaper Ad-Domari launched. It was privately owned, and widely read in Syria. It was highly critical of government, and government members. But it was closed down in 2003 on a technicality. Let's hope Sham will test the limits again.